A blend of Rooibos, carob & vanilla pieces creating a creamy, burnt sugar-esqe rooibos dessert tea. 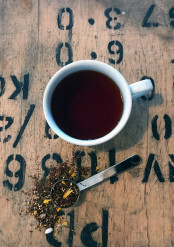 Rooibos or 'Redbush' Tea is grown in the western cape of South Africa and although many attempts have been tried to cultivate it elsewhere they have all failed. . Although there are little studies on the herb it is known that it carries very high antioxidants, more than that of green tea albeit slightly different types. Infuse one tea measure per pot or one heaped teaspoon per cup, use freshly boiled water 100ºC, brew 3-5 minutes. we always cover our tea while it’s infusing, this keeps all the heat in the cup whilst allowing the correct brewing time. Good quality loose leaf rooibos can typically be infused a couple of times. Why not try as a Latte? as above brew one spoon of Rooibos in boiling water. Brew for 3-5 minutes to make a concentrate of the tea (this espresso) then top with hot, frothy milk. lovely tea - prompt delivery - all good, thank you! I had a follow up email and phone call from Amy about availability but also about new possible recipes... excellent service. Service rating : The large variety of teas from Suki Teahouse are outstandingly good! So many to choose from and supplied as both loose teas and teabags. Cannot recommend them highly enough and delivery is by return. Product : This is SO GOOD! Try some yourself. Service rating : Very quick service and tea excellent. Would definitely recommend. Product : Superb product. Congratulations to whomever came up with the idea of a Creme brûlée flavoured tea!